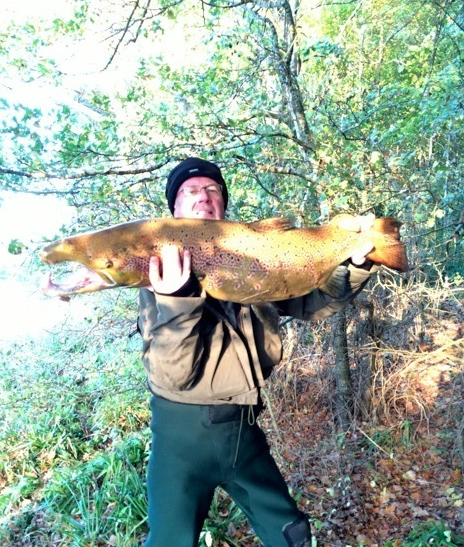 23 kg salmon in river Tweed! ”Salmon angler Shamus Jennings has rocked the world of fly fishing by landing the biggest salmon of 2013. The huge fish caught at Boleside Beat on the River Tweed in the Scottish Borders, it measured 50in long with a 33in girth which Dr Campbell, biologist form the Tweed Foundation, using the prescribed formula to calculate the fish’s weight, put the fish at approximately 50lb. Shamus who is a part-owner of the beat with his brother Francis, couldn’t believe his eyes when he eventually brought the massive fish to the net: “It’s taken me almost 40 years to catch a 25 pounder, (caught the day previously on the same beat) but this is simply incredible,” said Shamus who has fished for salmon all over the world. Fishing from the boat, Shamus hooked the fish in Glenmayne pool using a Boleside shrimp that head boatman Nigel Fell had previously created weeks earlier in the form of a tube fly with a local fly dresser. After 35 minutes the fish was eventually brought to the boat, when Shamus said: “This was the first we saw of the fish and we were shocked at the size of its head.